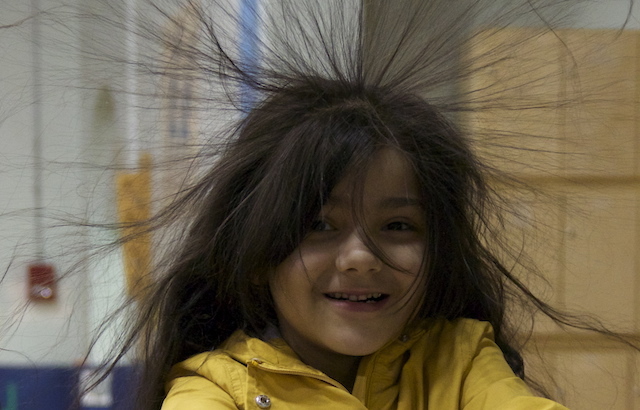 More than 88 Perkins, Lincoln and Kelley School families had fun learning about some of the marvels of science together as they participated in the fourth annual Family Science Night at Perkins School April 3rd. The 90-minute, Perkins School PTA-sponsored event featured 18 engaging, hands-on stations in three areas that included: building molecules, human anatomy, hovercrafts, life cycles, microscopes, rocks, virtual reality, coding, a germ station, hands-on play, kinetic sand, volcanos, a marble run, simple machines, the solar system and static electricity. Julia Anello, whose son, John, attends Kindergarten at Perkins; daughter, Lilly, attends second grade there and son, Noah, is a fifth grader at Kelley school started Family Science Night four years ago and organized the PTA-sponsored event again this year. “Science night just keeps getting better,” Anello said. “I look forward each year to seeing the excitement on the kid’s faces as they make each new discovery. We had a lot of excitement around our new Virtual Reality Station this year. The kids got a kick out of seeing such things as the solar system and anatomical parts in 3-D that they are able to manipulate. “I am thankful to have district support for my passion of sharing science! It was so nice to see our Superintendent Matt Cook, Assistant Superintendent Krista Lewis, Director of Pupil Services Monica Stadler and several Board of Education members as well as Perkins Principal Sue Achille there. It makes a very long day for these folks and I appreciate their dedication,” she continued. Besides Anello, Perkins PTA members Crystal Emmell and Julie Nevilizer and Lincoln PTA member Chris Hobart volunteered along with Perkins School staff Amanda Crowder and Laura Bouwens. Other volunteers included Newark Middle School students Makalya Miller, Lori Hobart and Anna Lanse and Newark High School students McKinley Miller, Aiden Lanse, Anna Bouwens, Ella Crowder and Jensyn Cintron. Anello also thanked NHS physics teacher Aaron Harrington who has participated in the event all four years teaching about static electricity properties with a hair-raising ,Van de Graaff Generator demonstration.